The list just keeps growing for the benefits of omega-3 fatty acids and overall health. The newest to the list is breast cancer. A study just published in the journal of Cancer Epidemiology, Biomarkers & Prevention surveyed approximately 35,000 postmenopausal women, ages 50 to 76, for their use of various specialty supplements (1). The 24-page summary took into account past and present use of supplements as well as frequency (days/week) and duration (year). 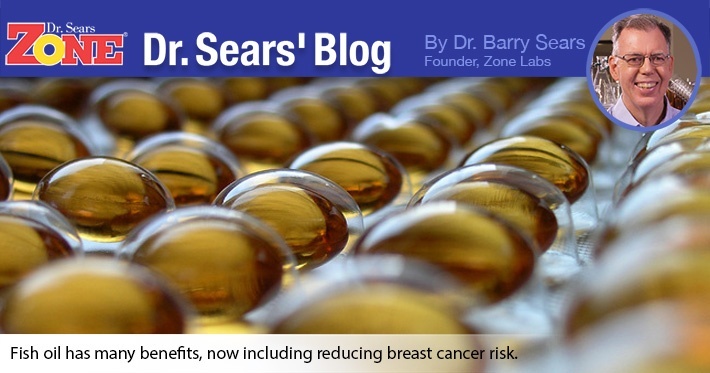 Individuals taking high purity omega-3 oil had a 32 percent reduced risk of developing breast cancer, whereas other supplements typically taken to reduce menopausal symptoms (e.g., black cohosh, dong quai, soy, or St. John's wort) had no association. Although further research needs to be conducted, this again adds to the growing body of evidence on the benefits of omega-3s for disease prevention. Why didn't this survey answer the question about if they had taken more, would they have seen even better results? Because cancer, like all chronic diseases, is driven by silent inflammation coming from increasing levels of Toxic Fat (i.e., arachidonic acid). High purity omega-3 oil dilutes Toxic Fat, but only a strict anti inflammatory diet can actually reduce Toxic Fat. Follow an anti-inflammatory program consisting of a strict anti inflammatory diet, ultra-refined high purity omega-3 oil concentrates and anti-inflammatory polyphenols to reduce the driving force for virtually all chronic disease. Brasky TM, Lampe JW, Potter JD, Patterson RE, White E. Specialty supplements and breast cancer risk in the VITamins And Lifestyle (VITAL) Cohort. Cancer Epidemiol Biomarkers Prev. 2010 Jul;19(7):1696-708.